Now some missives on my day. 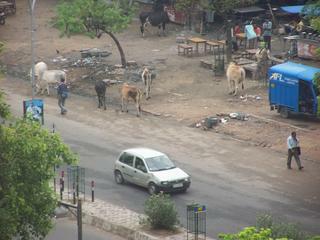 At various points in the day I had glanced out my room window and noticed that there were cattle in the street. In general, I wasn't too surprised, but this is the Ring Road so it is quite a busy thoroughfare. Drivers just stopped or went around the cows if they wandered too far into the road. 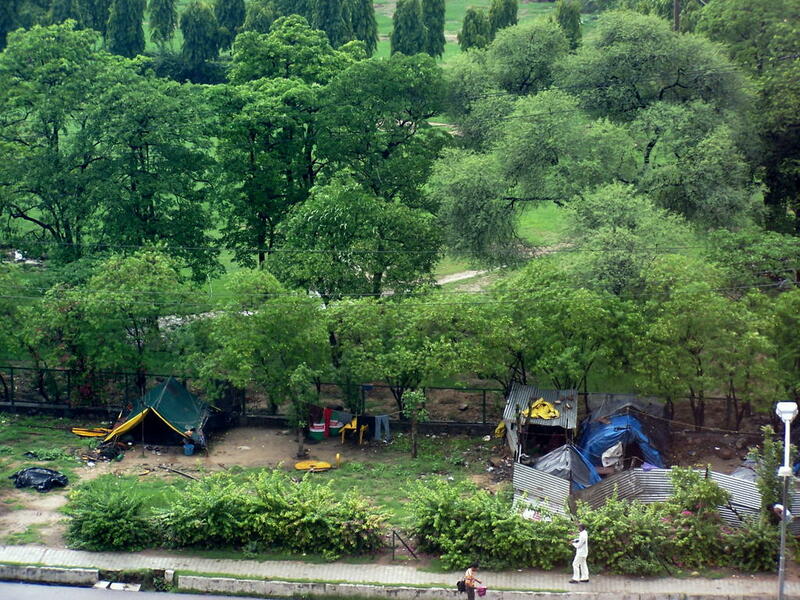 Also, there are some tents (made from poly taps) across from the hotel that people obviously live in. Given the location and local "flavor" I was a little surprised at this. Driving too and from the location where the office will be located, there were many times that local males were observed urinating in the street and sidewalks. Even when we pulled into the office complex, one of the security guards at the street entrance was doing his business next to the guard shack. Not behind it or on the far, less observable side, but between it and the street. Rocks. Everywhere we went there were piles of rocks beside the road. At first I thought they were from construction or part of some type of erosion control during monsoon season. But, when I asked, nobody seemed to know why they were there -- just that they were. 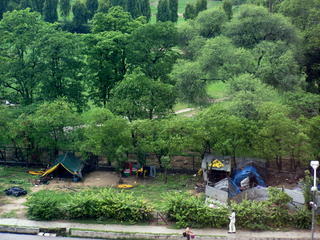 Driving in New Delhi is just like driving in any crowded metropolis. As Americans, we are more used to order by driving in lanes, stopping at red lights, using turn signals (well, maybe we don't do that as much as we should). In these other parts of the world, I have noticed that these things are primarily ignored unless there are police around. A two-lane road will frequently be supporting three or four lines of cars. Traffic at stop lights all crowds together to fit as many cars as possible into as small a space as possible. And, everyone uses their horn all the time. ALL THE TIME! It seems to be almost constantly on. I couldn't wait to get back to the relative silence of my room to give my aural senses a break.